The Maritime Museum in Vergennes, Vermont is a fascinating place to visit. The website features a Shipwreck webcast of the deep the cold dark waters of Lake Champlain to the wreck of the Sarah Ellen. Hear the tragic story of the schooner’s sinking in the winter of 1860. Then meet our nautical archaeologists who tell of her underwater discovery in 1989. See footage captured by a remotely operated vehicle (ROV), over 300 feet below the surface. Click here to view, it’s worth the watch. Lake Champlain has over 300 shipwrecks in it. The Maritime Museum exhibits nautical archaeology, antique boats, photo and art shows. There are fourteen exhibit buildings and a fleet of historic replica vessels to view. If you are in the area, I’d recommend a visit to this interesting museum. Leesa finds herself dethroned as head of L. L. Lane Unlimited. Her anger and bitterness towards Bill and Lyza lead her into temptation. Will Leesa humble herself enough to change before she hits rock bottom? Chuck O’Malley shows up, adding to her misery, and Leesa decides that Christians ruined her life. Thanks to her new friend, Lennie, her life turns around. Is love shining through? Will Cook’s prayers for Leesa be answered, or is the Lord teaching her about patience and grace? Vicki Andree lives with her husband, David, in Erie, Colorado. They enjoy family reunions in Steamboat Springs, Colorado and the seashore at Daytona Beach, Florida. She has been to Israel three times. She has been blessed to travel to many of the places mentioned in the Lane Trilogy. She earned her doctorate in Practical Theology in Biblical Counseling in 2006 and is a certified Advanced Splankna practitioner. Vicki is a committed Christian, using her talents to serve and advance the Kingdom of God. She is a member of ACFW and the Christian Writers Guild. David and Vicki attend a Messianic congregation in Denver, Colorado. 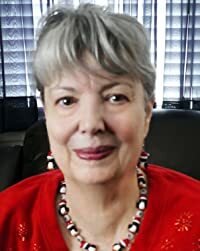 To learn more about my Amazon author page, click here. Who reveals Lyza Lane’s secret? Find out how her father reacts to the news that his legacy is in danger. Lyza’s world turns upside down more than once. David stands by Lyza, but is he the man God chose for her? What changes Leesa Lane from the sweet little sister to a no-holds-barred corporate mogul? Her dreams for Kramer’s Island crumble before her eyes. The love of her life rejects her, sending her on a downhill spiral. What tragedy ends Lawrence’s thirty-five years of faithful marriage? Will Cook’s faith remain strong? And what happens when Chuck O’Malley shows up in LA? To learn more about this compelling mystery click here. I love books. Love reading them and love writing them. My trilogy is now out in audio form. Today we will focus on Lyza’s Story. It’s easier for a camel to pass through the eye of a needle than for a rich woman like Lyza Lane to be saved. Yet with God all things are possible. Lyza’s billionaire lifestyle leaves no room for religion. She enjoys a meaningless jet-setting existence, keeping busy with L.L. Lane Unlimited, her father’s successful conglomerate, and her mother’s “Save the Orchids” campaign. Little does Lyza know that her lifelong employee constantly prays for her salvation. Be encouraged as Cook’s humble prayers and service throughout the story illuminate God as He works out His plan in Lyza’s life. Click here for audio information. 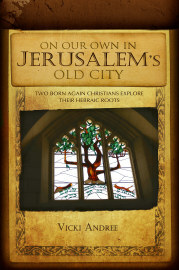 Join two born-again Christians exploring the Old City of Jerusalem without a tour group. Experience the excitement of discovering the Hebraic roots of our faith. Visit archaeological sites and museums that strengthen our faith. Discover Jewish holidays and learn their significance to Jesus and to us. Read about thriving churches in the Old City. Mingle with citizens of the Old City. Learn how to shop the souk and communicate with vendors. Hear the call of ancient stones from the Holy Land. Worship with us as we meet with God in churches, synagogues, mosques, tombs, tunnels, ramparts, and the Western Wall. Now available on Audible for your listening pleasure. 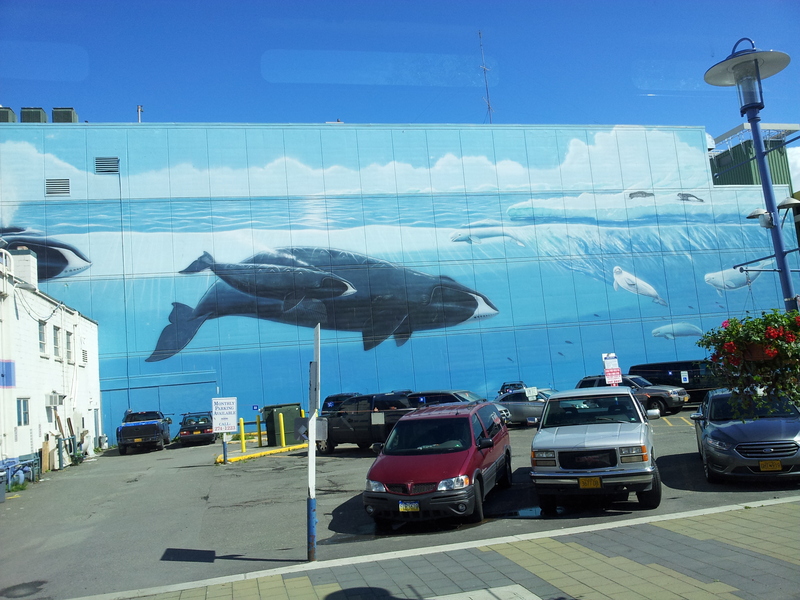 Hanging out in Anchorage, Alaska, David and I found this beautiful painting on the side of a building. With the blue sky above, it almost looks like we are in the water. I’m sure a professional photographer could have made it look like that, but you have to settle for me. I believe the whale, big as it is, was less than life sized. That causes me to pause. Here I am with my new best friend. He’s very friendly because he is stuffed. You can find several of these on the downtown street corners. I’ve always had a fascination with Alaska and with people who have the grit it takes to live there. When David said we should go, I jumped on it! Yes! I’m going to join the brave and hardy folks of our Northernmost state. The first thing I said was, “We should go in July or August.” What a wimp. I believe July and August are the best times to go. Look at these beautiful flowers. Everything seems bigger (don’t tell Texas) and brighter here. This is especially true of the trees and flowers. 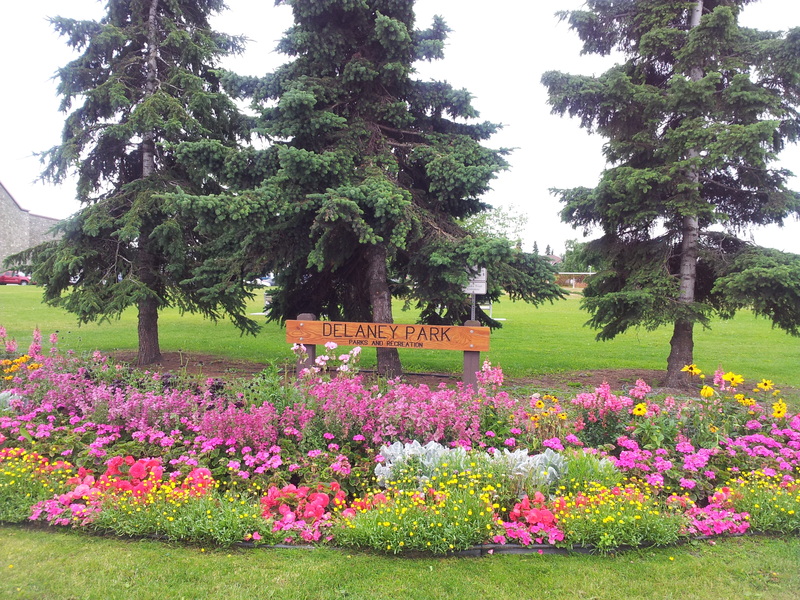 Delany Park was just across the street from our hotel. It made a nice walk down to the seashore. This is the picture I used for backdrop on my Facebook page. 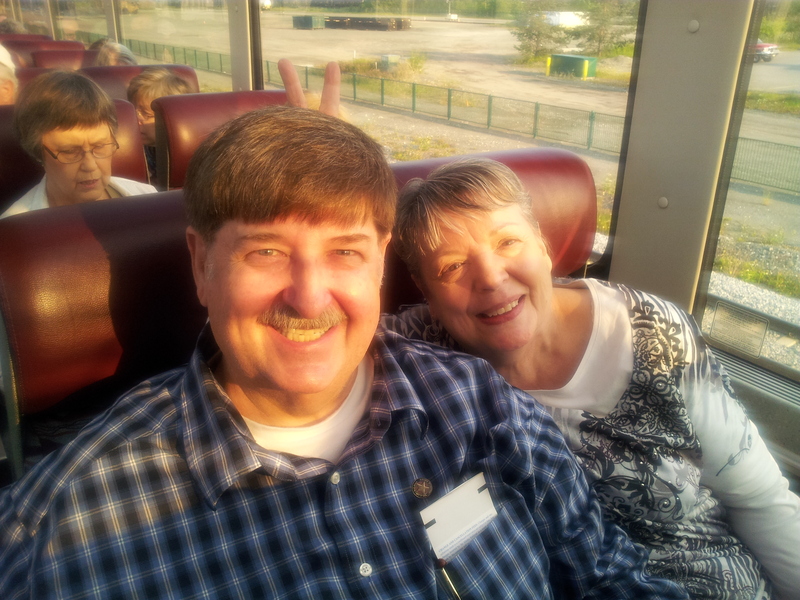 Here David and I are on the train from Anchorage to Denali National Park. This is a magnificent experience and you can not go to Alaska and not do this. Looking out the glass-domed roof, I saw a stunning bald eagle fly over us. I swear he looked me right in the eye. 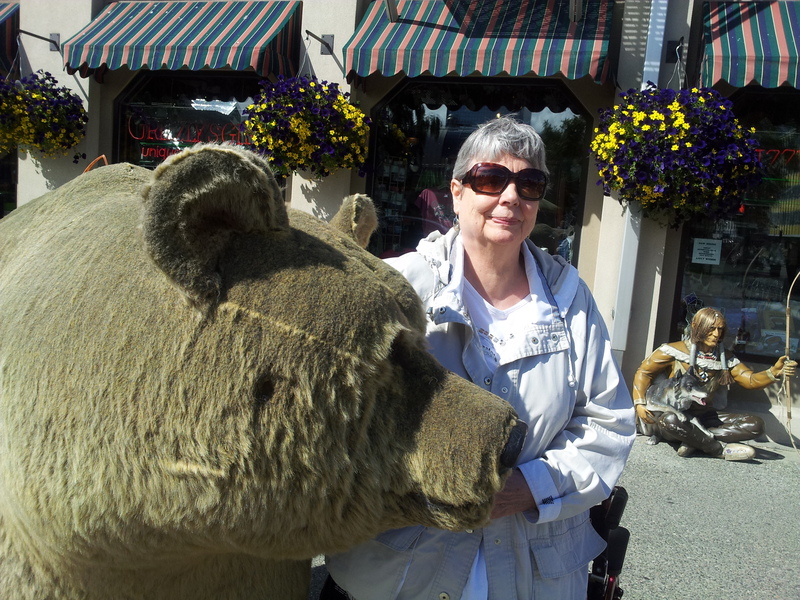 We observed all kinds of wildlife on this ride. 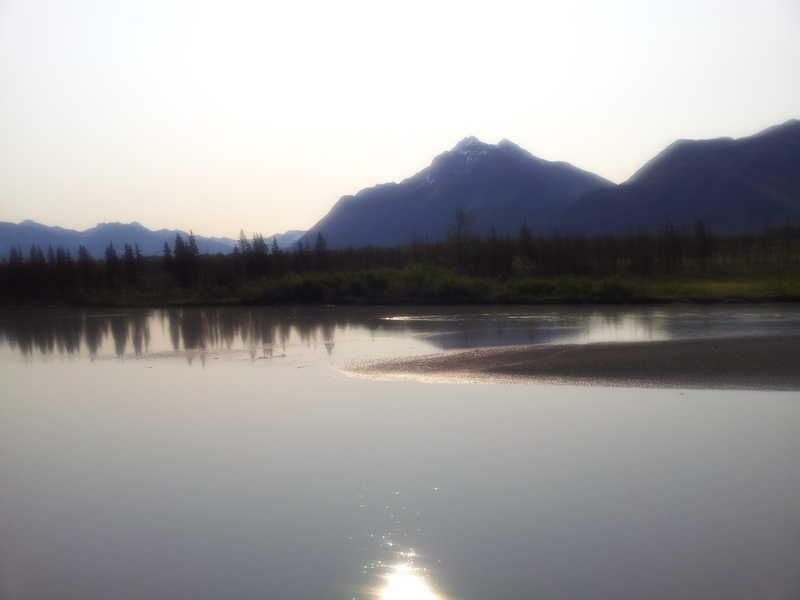 We stayed one night in Talkeetna, Alaska. Every where you look there is a post card picture.